For other uses, see Dewsbury (disambiguation). The Domesday Book of 1086 records the name as Deusberie, Deusberia, Deusbereia, or Deubire, literally "Dewi's fort", Dewi being an old Welsh name (equivalent to David) and "bury" coming from the old English word "burh", meaning fort. Other, less supported, theories exist as to the name's origin. For example, that it means "dew hill", from Old English dēaw (genitive dēawes), "dew", and beorg, "hill" (because Dewsbury is built on a hill). It has been suggested that dēaw refers to the town's proximity to the water of the River Calder. In Anglo-Saxon times, Dewsbury was a centre of considerable importance. The ecclesiastical parish of Dewsbury encompassed Huddersfield, Mirfield and Bradford. Ancient legend records that in 627 Paulinus, the first Bishop of York, preached here on the banks of the River Calder. Numerous Anglian graves have been found in Dewsbury and Thornhill. Dewsbury Minster lies near the River Calder, traditionally on the site where Paulinus preached. Some of the visible stonework in the nave is Saxon, and parts of the church also date to the 13th century. The tower houses "Black Tom", a bell which is rung each Christmas Eve, one toll for each year since Christ's birth, known as the "Devil's Knell", a tradition dating from the 15th century. The bell was given by Sir Thomas de Soothill, in penance for murdering a servant boy in a fit of rage. The tradition was commemorated on a Royal Mail postage stamp in 1986. Dewsbury market was established in the 14th century for local clothiers. Occurrences of the plague in 1593 and 1603 closed the market and it reopened in 1741. Throughout the Middle Ages, Dewsbury retained a measure of importance in ecclesiastical terms, collecting tithes from as far away as Halifax in the mid-14th century. John Wesley visited the area five times in the mid-18th century, and the first Methodist Society was established in 1746. Centenary Chapel on Daisy Hill commemorates the centenary of this event, and the Methodist tradition remained strong in the town. In 1770, a short branch of the Calder and Hebble Navigation was completed, linking Dewsbury to the canal system giving access to Manchester and Hull. By the time of the Industrial Revolution, Dewsbury was a centre for the shoddy and mungo industries which recycled woollen items by mixing them with new wool and making heavy blankets and uniforms. The town benefited economically from the canal, its location at the heart of the Heavy Woollen District, and its proximity to coal mines. The railway arrived in 1848 when Dewsbury Wellington Road railway station on the London and North Western Railway opened; this is the only station which remains open. Other stations were Dewsbury Central on the Great Northern Railway which closed in 1964 and Dewsbury Market Place on the Lancashire and Yorkshire Railway which closed in 1930; a fourth goods-only railway station was built in the early 20th century at Savile Town by the Midland Railway. In 1985 a bypass road was built on the site of Central Station and its adjacent viaduct, and nothing remains of Market Place railway station. The 19th century saw a great increase in population, rising from 4,566 in 1801 to around 30,000 by 1890. The town's rapid expansion and commitment to industrialisation resulted in social instability. In the early 19th century, Dewsbury was a centre of Luddite opposition to mechanisation in which workers retaliated against the mill owners who installed textile machinery and smashed the machines which threatened their way of life. In the 1830s, Dewsbury was a centre of Chartist agitation. In August 1838, after a speech by Chartist leader Feargus O'Connor, a mob of between five and seven thousand people besieged the Dewsbury Poor Law Guardians in the town's Royal Hotel. The mob was dispersed by troops. Trouble flared in 1840 when radical agitators seized control of the town, and troops were stationed to maintain order. This radical tradition left a legacy in the town's political life, its first elected MP in 1867 was John Simon, a Jewish lawyer from Jamaica and a Liberal. The tradition of firing the "Ten o'Clock" gun dates from 1815 and was a hangover from the Luddite problems. It was fired from Wormald and Walker's Mill to reassure that all was well. It could be heard all over the area. Eventually the actual gun was replaced with a specially made firework but the tradition was discontinued in 1983 with the closure of the mill. The mills were family businesses and continued manufacturing after the wool crisis in 1950–51, which saw Australian sheep farmers begin to charge higher prices. However, the recovery of the late 1960s was reversed by the 1973 oil crisis, and the textile industry in Dewsbury declined, with only bed manufacturing remaining a large scale employer. After 2005, Dewsbury was labelled a troubled town after negative press reports and became "the town that dare not speak its name" after high-profile crimes brought it into the media spotlight. In June, a girl of 12 was charged with grievous bodily harm after attempting to hang a five-year-old boy from Chickenley. Mohammad Sidique Khan, ringleader of the group responsible for the 7 July 2005 London bombings, lived in Lees Holm. On 19 February 2008, Shannon Matthews, a nine-year-old girl from the Moorside Estate, was reported missing. After a 24-day hunt which attracted huge media and public attention nationally, she was found hidden in a flat in the Batley Carr area on 14 March 2008. Her mother Karen Matthews, along with Michael Donovan, the uncle of her step-father Craig Meehan, were later found guilty of abduction and false imprisonment and both jailed for eight years, as part of a plot to claim the reward money for her safe return by pretending to have solved her disappearance. In October 2010, the Dewsbury Revival Centre opened, in the refurbished former St Mark's Church on Halifax Road, the church attended by the Titanic bandmaster Wallace Hartley. In July 2014, Kirklees Council enforced a media ban covering the visit of the Princess Royal who was due to deliver a 1-minute and 15 second speech on the importance of restorative justice. Kirklees Council later responded that the highly unusual media ban had been insisted upon by the Royal Household. Buckingham Palace however was mystified over the ban with a Royal spokesman stating: "This visit has been openly listed in the future engagements section on the Royal website for the last eight weeks. There are no restrictions on reporting on the event from the Royal Household." Dewsbury was incorporated as a municipal borough in 1862. Its first mayor was Dr George Fearnley. The Reform Act of 1868 constituted Dewsbury a parliamentary borough, and Liberal candidate John Simon, serjeant-at-law, was returned as the borough's first MP. The Victorian town hall standing in front of the old marketplace dates from 1886–89. Dewsbury's boundaries were expanded to include the urban districts of Ravensthorpe, Thornhill, and Soothill Nether, and part of Soothill Upper, in 1910, and in 1913 it was elevated to county borough status. "Soothill Nether" refers to the current east end of the town, although at that time Chickenley and Chidswell were hamlets, and Earlsheaton contained the bulk of the area's population. In 1974, responsibility for local government passed to Kirklees Metropolitan Council, with its headquarters in Huddersfield. The population of Dewsbury has remained broadly static over the past century: the 1911 census recorded 53,351 people, and the 1971 census 51,326 people, making it the fourth least populous county borough in England (after Canterbury, Burton upon Trent and Great Yarmouth). 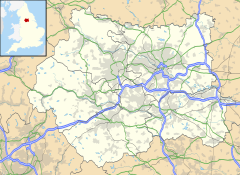 Dewsbury is situated between Leeds and Bradford 8 miles (13 km) to the north, Huddersfield a similar distance to the south west, and Wakefield 6 mi (10 km) east. Its proximity to these major urban centres, the M1 and M62 motorways and its position on the Huddersfield Line, served by the TransPennine Express, have contributed to its popularity as a commuter town. Dewsbury is part of the West Yorkshire Urban Area, although its natural boundaries are not well defined, with built up areas of the town running into Batley, Heckmondwike and Ossett. Geologically, the town is situated on rocks of the Carboniferous Period, consisting of coal measures and gritstones. Quaternary Period rock, glacial deposits and gravels exist in the Calder Valley. Coal, sandstone and gravel have been exploited commercially. Average rainfall is 100 cm per annum. The town is dominated by hills, notably Earlsheaton, Dewsbury Moor, Staincliffe and Thornhill. The town centre is between 130 and 180 feet (40 and 55 metres) above sea level, rising to 360 ft (110 m) at Earlsheaton and Batley Carr, and 755 ft (230 m) at Grange Moor. The approach from Earlsheaton through the Wakefield Road cutting, constructed in 1830, is dramatic with the view of the town centre in the Calder Valley opening up. Dewsbury has a number of districts with different geographical and socio-economic patterns, they are, Chickenley, Crackenedge, Dewsbury Moor, Earlsheaton, Eastborough, Eightlands, Flatts, Ravensthorpe, Savile Town, Shaw Cross, Scout Hill, Thornhill Lees, Westborough, Westtown. Batley Carr, Hanging Heaton and Staincliffe have areas which lie in both Dewsbury and neighbouring Batley. Thornhill, Briestfield and Whitley are part of Dewsbury. Thornhill was annexed in 1910. From the outset of the industrialisation of the town with its many mills, a large influx of Irish workers arrived in the town, settling in the Westtown area. This area has the large and imposing Our Lady and St. Paulinus Roman Catholic Church and its school, once run by the nuns of the area. The Irish National Club also is home to Dewsbury Celtic amateur rugby league club, with its many age groups of players. The town has a large Asian community. Savile Town and Ravensthorpe are populated mainly by Muslims of Indian and Pakistani origin. In recent years, there has also been an immigration of Iraqi Kurds and Hungarians into the town. Dewsbury has been accused of having a controversial Shariah arbitration court. The Dewsbury Moor, Ravensthorpe and Chickenley areas are classed among the 10% most deprived areas in the UK. In contrast to some British towns and cities, the east side of the town is generally more affluent. The majority of houses in the town are in the cheapest band for council tax, for house prices are amongst the lowest in the country. The town centre includes large retailers such as Asda, Sainsbury's, Next and Matalan it also has many other stores. The local market once consisted of 400 stalls and was one of the busiest in Yorkshire and in years gone by drew coach-loads of visitors to the town. Wednesdays and Saturdays are the normal market days with the popular flea market on Fridays. The town's mills were located just south of the River Calder in the town centre. As the mills closed, this area became a large brownfield site. However, many of the units have been reoccupied and the town's largest employer, Carlton Cards, is based in this area. Dewsbury bus station serves the town of Dewsbury. The bus station is managed and owned by Metro (West Yorkshire PTE). The bus station was rebuilt in 1994 with a main passenger concourse and 19 bus stands. The town is served on the railway network by Dewsbury railway station. Dewsbury RLFC play in the Kingstone Press Championship. They play at the Crown Flatt, on Owl Lane, towards Ossett, on the site of the old Savile & Shaw Cross Colliery. Shaw Cross Sharks is an amateur Rugby League club. The club was founded in 1947 and has produced several players into the professional game, including Mike Stephenson, Nigel Stephenson and David Ward. They operate from Shaw Cross Club for Young People and play their home fixtures at the adjacent Paul Lee Hinchcliffe Memorial Playing Fields. The open age first team is the National Conference League. Dewsbury Celtic play in National League 3, their ground is on the west side of the town, in Crow Nest Park. The club's headquarters are at the Dewsbury Irish National Club on Park Parade. Also the home of the Dewsbury Rangers Football club, with over 300 members from the ages of six through to the old boys' teams it is one of the largest in the area. Dewsbury Museum was located within the mansion house in Crow Nest Park. The museum closed to the public in November 2016. Nearby attractions include the National Coal Mining Museum for England. Dewsbury Town Hall contains a 700-seater concert hall and regularly hosts concerts, exhibitions, live music, cabaret evenings and weddings. The town also has an annual event called Spirit, a street theatre show every winter which takes place in the town centre. 2018 comedy film Destination: Dewsbury was filmed and part set in the town. The production was shot in 2016 and premiered at the 2018 Beverly Hills Film Festival. Dewsbury had two grammar schools – Wheelwright Grammar School for Boys and, further up the hill, Wheelwright Grammar School for Girls. The 1970s education reforms converted these two establishments to high schools and they were renamed Dewsbury College and Birkdale High School. Dewsbury College was merged with Huddersfield Technical College to become part of Kirklees College in 2008, and is now known by that name. Birkdale High School closed in July 2011. In the 2005 School League Tables, Dewsbury's Eastborough Junior, Infants and Nursery schools were reported to have the most consistently improved results over the past four years. However, the headteacher of the school, Nicola Roth, has been highly critical of School League Tables in the UK and has been reported to have said, "It would be better if league tables did not exist". Batley College of Art and Design, which is part of Kirklees College (Dewsbury Centre), has a strong reputation for print and textile-based art work, whilst St John Fisher Catholic Voluntary Academy is a specialist Sports College and is one of the few schools in the area with a Sixth Form. Sir Thomas Clifford Allbutt (1836–1925 – died in Cambridge), physician; inventor of the medical thermometer. Betty Boothroyd, Baroness Boothroyd (born 1929), politician; first female Speaker of the House of Commons between 1992 and 2000. Leigh Bromby (born 1980), footballer for Leeds United. Alistair Brownlee, British triathlete, having won the gold medal at the 2012 London Olympics and the 2014 Commonwealth Games. Sam Burgess (born 1988), English professional rugby league player for South Sydney Rabbitohs of the National Rugby League and for England, he is a dual-code rugby international. Francis Cummins (born 1976) is an English professional rugby league coach and former player. He played for Leeds Rhinos and represented Great Britain, England and Ireland at international level. Matt Diskin (born 1982), rugby league footballer for Bradford; his career began at the amateur Dewsbury Moor ARLFC. Tim Fountain (born 1967), playwright and author. Andrew Gale (born 1983), cricketer and captain for Yorkshire. Joel Graham (born 1977), bassist for thrash metal band Evile. Brendon Grimshaw, (1925–2012), managing editor, the Standard, Dar es salaam, Tanzania. Bob Hardy (born 1980), bassist for popular Scottish post-punk revival band, Franz Ferdinand. Tom Kilburn (1921–2001), computer engineer; co-inventor of the first stored-program computer. Betty Lockwood, Baroness Lockwood (born 1924), politician and activist for women's rights. Keith Mason (born 1982) is an actor and former rugby league footballer. He represented England (Under-21) and Wales at international level. Andrew Morton (born 1953), writer, journalist and biographer of royalty and celebrities. Kazia Pelka (born 1960), actress famous for roles in soap-operas. Sir Owen Willans Richardson (1879–1959), physicist, won the Nobel Prize in Physics in 1928 for his work of thermionic emission. Mike "Stevo" Stephenson (born 1947), Sky Sports commentator and former rugby league footballer. Gary Sykes (born 1984), former super featherweight boxing champion. Richard Tracey (born 1979), footballer. Eddie Waring (1910–1986), rugby league coach, commentator and television presenter. Sayeeda Warsi, Baroness Warsi of Dewsbury (born 1971), Conservative politician. Tommy Weston (1902–1981), jockey who rode eleven English Classic winners and was Champion Jockey in 1926. Dewsbury is referenced in the Beatles' 1967 film Magical Mystery Tour. A line of dialogue in the film has one of the magicians (all portrayed by the Beatles themselves) – who are keeping an eye on the whereabouts of the bus that is taking its passengers on the journey of the film's title – exclaim: "The bus is 10 miles [16 km] north on the Dewsbury road and they're having a lovely time!" Dewsbury is also referenced in the 1991 single "It's Grim Up North" by the Justified Ancients of Mu Mu (also known as the KLF). The 1960 book A Kind of Loving is set in a fictional city named "Cressley", but its description was based upon Dewsbury. The author, Stan Barstow, was born in Horbury and grew up in Ossett – both of which are just to the east of Dewsbury. More recently, the phrase "Dewsbury noir" has been used to describe the violent novels of David Peace, who was born in Dewsbury but lives in neighbouring Ossett. Channel 4 documentary Educating Yorkshire followed the everyday lives of the staff and students of Thornhill Community Academy, a secondary school in Dewsbury, West Yorkshire. A Christmas special entitled Educating Yorkshire at Christmas was aired on 19 December 2013. In January 2014, the show won best Documentary Programme at the National Television Awards. ^ "Calderdale: Halifax to Pontefract". Yorkshire. Retrieved 5 January 2006. ^ "Dewsbury". White's History. 1837. Retrieved 5 January 2006. "Antiquarians supposed the name, Dewsbury, to be derived from the original planter of the village, Dui or Dew, who … had fixed his abode and fortified his "Bury". Another conjecture holds, that the original name is Dewsborough, or God's Town" (1837). ^ Piwowarski, Pete. "Huddersfield One – Tolson Museum Booklets – Angles, Danes and Norse in the District of Huddersfield". Huddersfield1.co.uk. Archived from the original on 22 June 2013. Retrieved 22 April 2013. ^ "Eric Shackle's eBook – Bells". Retrieved 10 September 2016. ^ "Calder & Hebble Navigation". Canal & River Trust. Retrieved 9 April 2018. ^ "Nostalgia: Days when the Dewsbury ten o'clock gun was fired every night". Batley News. Retrieved 20 March 2018. ^ Wainwright, Martin (29 May 2008). "The name's Dewsbury". The Guardian. London. Retrieved 4 June 2009. ^ Norfolk, Andrew (28 May 2008). "Dewsbury: Kidnap, lynching and a suicide". The Times. London. Retrieved 4 June 2009. ^ "Hanging case girl spared custody". BBC News Online. BBC. 3 October 2005. Retrieved 4 June 2009. ^ "The Building". Dewsbury Revival Centre. Retrieved 10 September 2016. ^ Shaw, Martin (5 July 2014). "Princess Royal in Dewsbury – but media banned from reporting visit until she left". Retrieved 10 September 2016. ^ "Dewsbury MB/CB through time – Census tables with data for the Local Government District". Retrieved 10 September 2016. ^ "Muslims accused of running Islamic court – More Local News". Dewsbury Reporter. 1 May 2007. Retrieved 22 April 2013. ^ Ltd, Website designed by Assembly Studios and developed by Assembly Studios and Hexydec. "Creative Kirklees / Directory / Kirklees College / Huddersfield and Dewsbury". creativekirklees.com. Retrieved 8 March 2016. ^ "The best and worst results". BBC News. 19 December 2005. Retrieved 27 March 2010. ^ ""Born and bred Yorkshireman" gets top job at Asda". The Yorkshire Post. Retrieved 3 January 2018. ^ "Über unsere Welt". Retrieved 10 September 2016. Wikimedia Commons has media related to Dewsbury.